Is Andrew Cuomo’s free-college plan his 2020 presidential campaign announcement? The Excelsior Scholarship program — Gov. 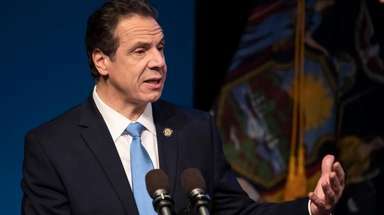 Andrew Cuomo’s initiative to make state college tuition-free for families earning less than $125,000 a year — is now a reality, after a bill signing ceremony at La Guardia Community College on Wednesday. And Cuomo took his victory lap in style. There was the video with sweeping shots of New York and a preacher-like Cuomo talking about how New York’s upward mobility helped his father become governor. There was the crowd of Hotel Trades Council union members peering over the rafters, perhaps vocal enough to make up for an audience that didn’t include many college students, most of whom were on spring break. There was the soaring rhetoric: “We say the dream lives,” Cuomo called. No child will “put their head on the pillow” and wonder if they’ll “have a chance to make it” in NY, he said. And, there was the guest of honor, Hillary Clinton, who played the good party soldier and came out of the woods to praise her fellow New Yorker. She wasn’t the only top Democrat to stump for Cuomo’s college plan. He launched the campaign at the same college with Sen. Bernie Sanders in January — meaning he’s already been lifted up by the 2016 primary candidates and leaders of both party wings, a nice boost as 2020 gets closer. Is the governor looking at a presidential run? The rhetoric and the hullabaloo about the Excelsior Program, perhaps a notch in a potential Cuomo campaign belt, are a little exaggerated. Critics point to the need for education investment in other parts of the university system and note the limited number of students Cuomo’s intervention will reach. Many New Yorkers, for example, are already able to cobble together free tuition at state schools through grants like the state’s Tuition Assistance Program, which devotes $651 million in yearly funding for public college students. Cuomo’s new scholarship is a last-dollar program, meaning it pays the bill left over after students claim other aid. That won’t reach every student: the City University of New York estimates that 25,000 students will meet the eligibility requirements of having family income under $125,000 and attending class full-time. The state university system has 80,000 students who meet the same requirements. But that is a small percentage of total undergraduate enrollment: 10 percent for CUNY and 20 percent for SUNY. Further, that’s just the total number of eligible students — some of those may already receive full scholarships from other sources. That’s hardly providing free college for all, like Sanders called for during the primaries. One way to look at Cuomo’s tuition plan is as a launching pad for national ambitions in that it charts a path similar to the one that nearly worked for Clinton. The old slogan “a progressive who makes progress” could even make a return. Not only would Cuomo be supporting some of the programs that Clinton adopted over the course of the primary, but he actually got them done in New York: compromises like the college scholarship that will benefit a crucial middle class voting population. Or a popular criminal justice reform, also confirmed this week, that will get nonviolent 16- and 17-year olds out of adult court. These are good wins for New York and could position the governor nicely. He’s a tough and relatively young campaigner. Some New York kingmakers beyond Sanders and Clinton, such as former Congressman Charlie Rangel, have also been supportive. But there is also an argument to be made that Cuomo is unsuited for the current populist moment, stirring speeches aside. His pugnacity is as often felt by Democrats as by Republicans. Where other Democrats such as Mayor Bill de Blasio are having a field day opposing President Donald Trump and channeling progressive uproar in the streets, Cuomo rarely criticizes Trump directly. That and a good incremental progressive gain like the college program may not be enough alone to exhort a nation to the polls. amExpress will be suspended tomorrow. It will resume on Monday, April 16.